A group of protesters hold up a “Women’s March Sacramento” sign during the annual Sacramento Women’s March on Jan. 20, 2018 in Sacramento, California. 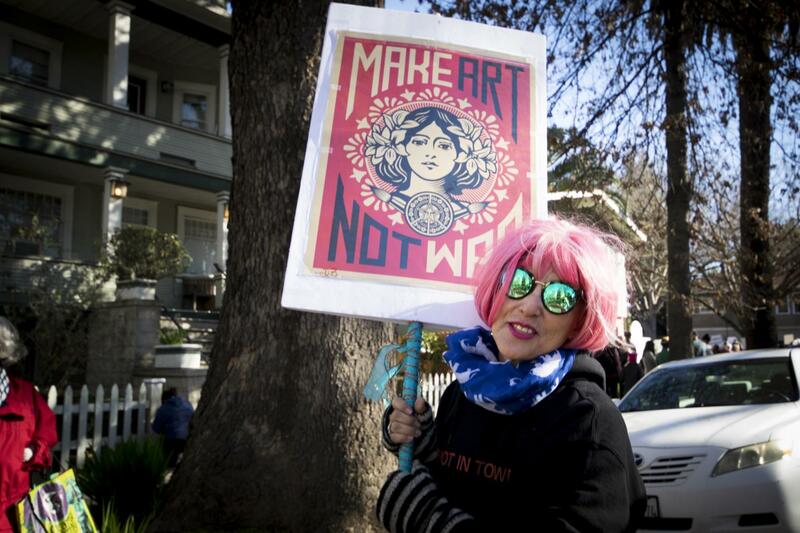 Maria Vargas poses with her sign at Southside park during the 2018 Women’s March on Jan. 20 in Sacramento, California. 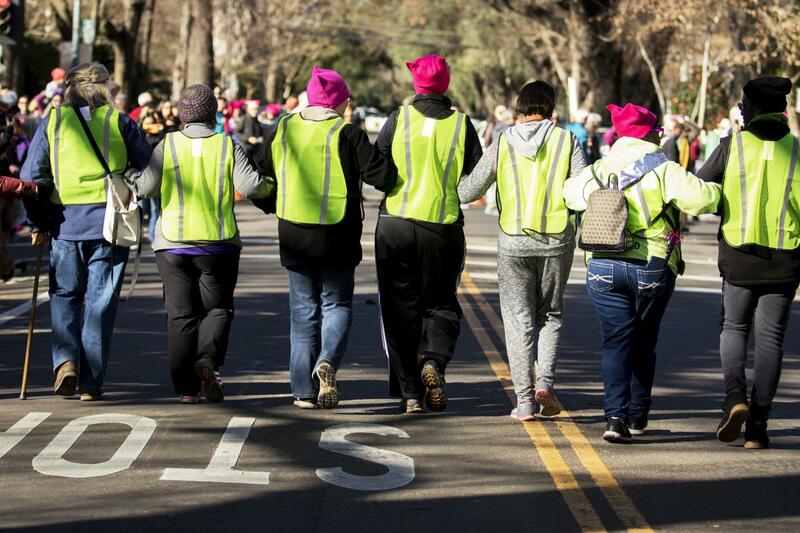 The Women’s March volunteers link arms as they help lead the march to the California State Capitol on Jan. 20 in Sacramento, California. 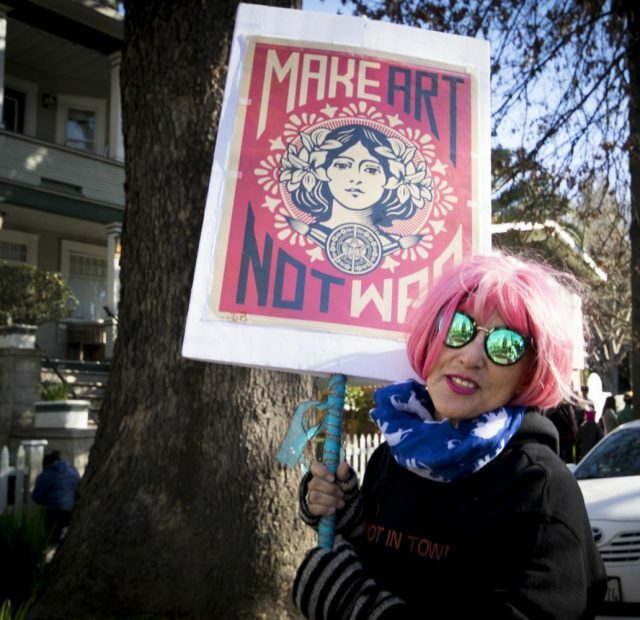 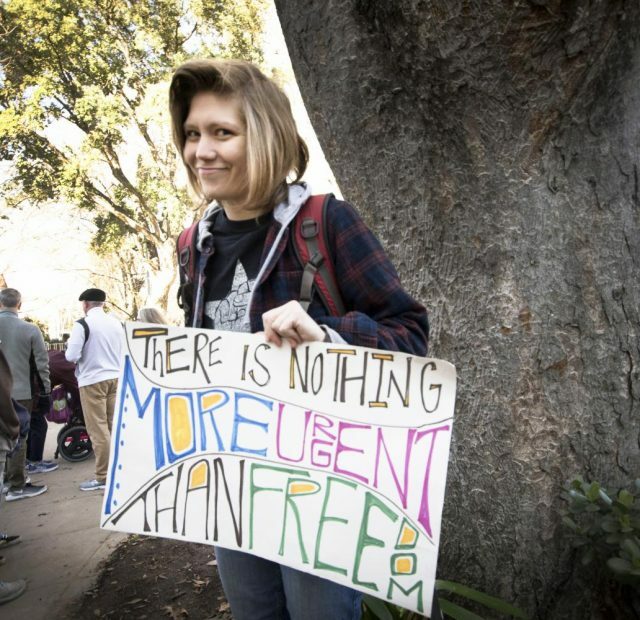 Grace Loescher poses with her sign at the 2018 Women’s March on Jan. 20, 2018 in Sacramento, California. 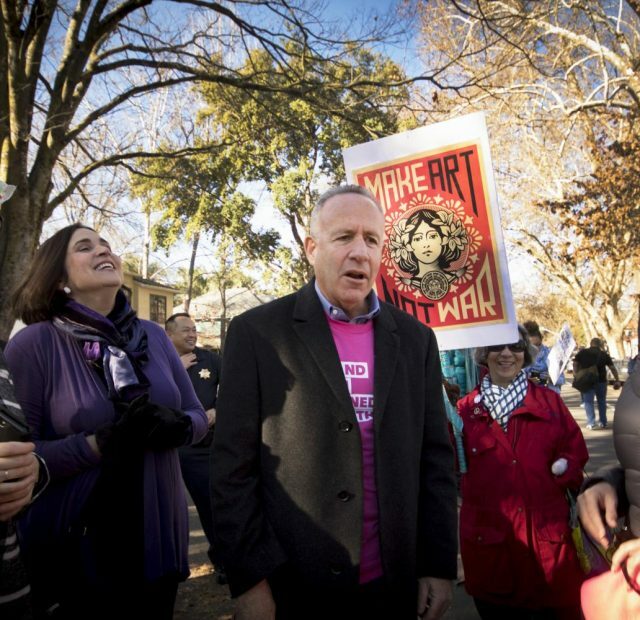 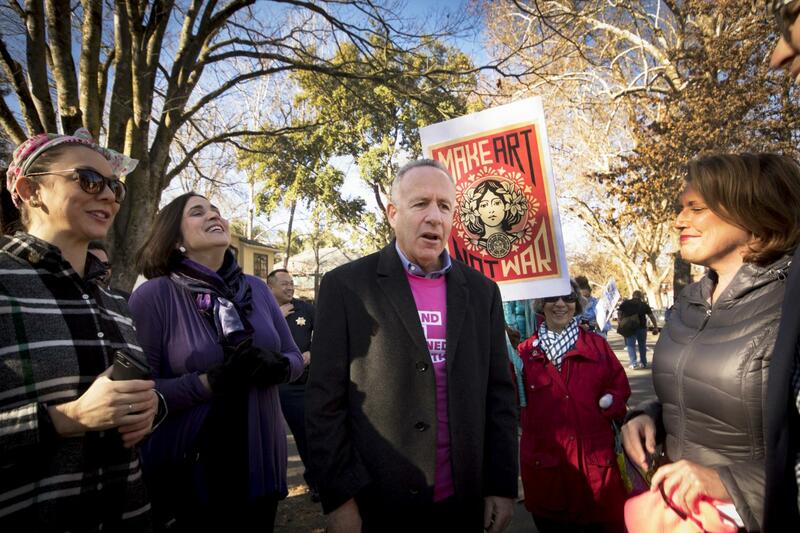 Sacramento mayor Darrell Steinburg shows his support during the Women’s March on Jan. 20, 2018 in Sacramento, California. 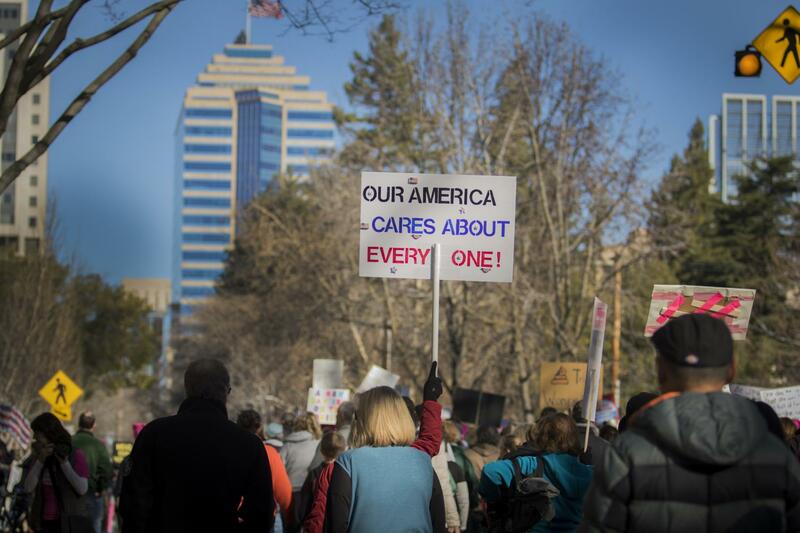 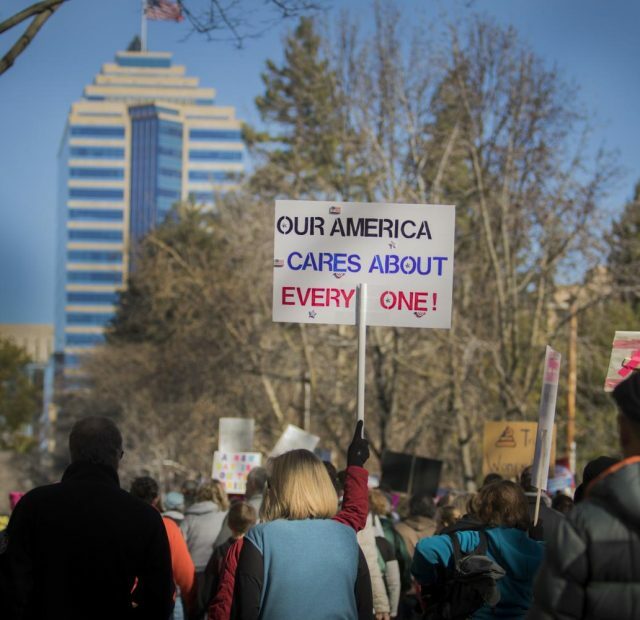 A protester holds up a “Our American cares about everyone” sign during the march to the California State Capitol to support women’s rights on Jan. 20, 2018 in Sacramento, California. 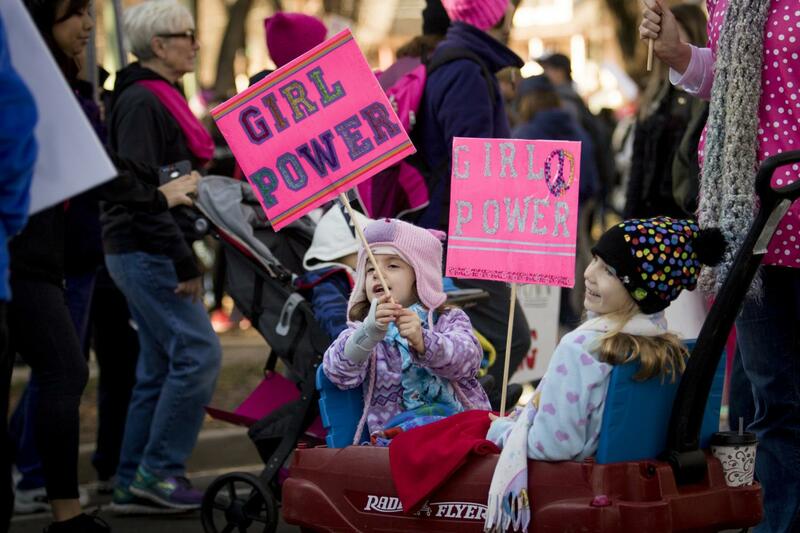 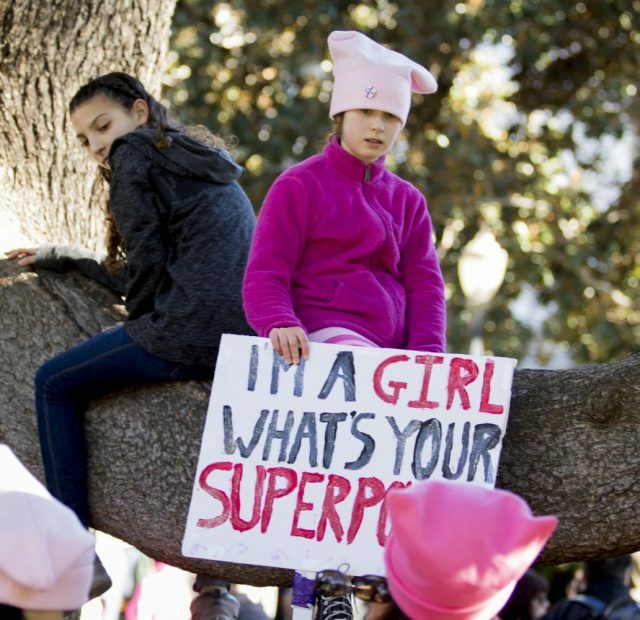 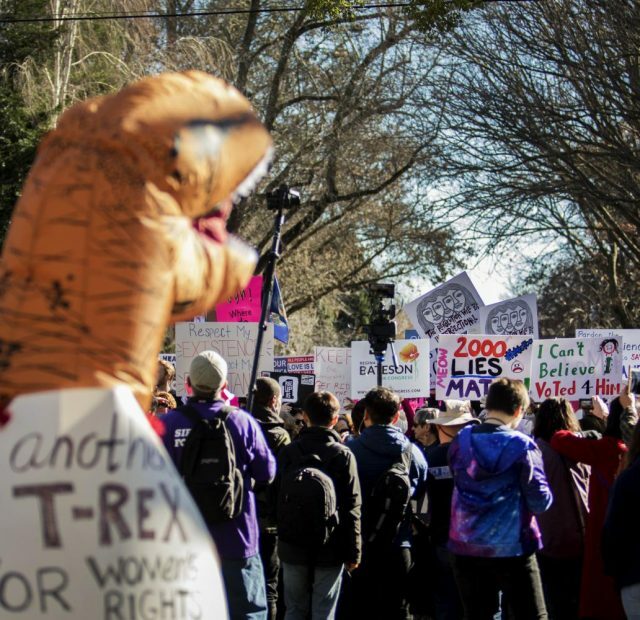 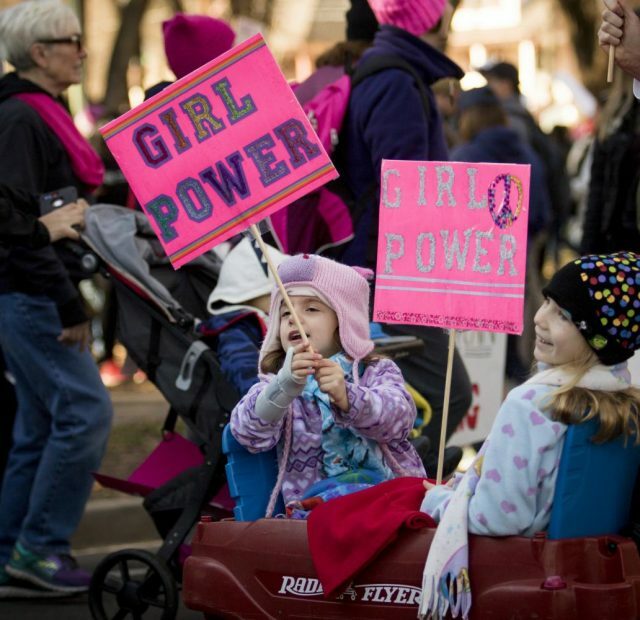 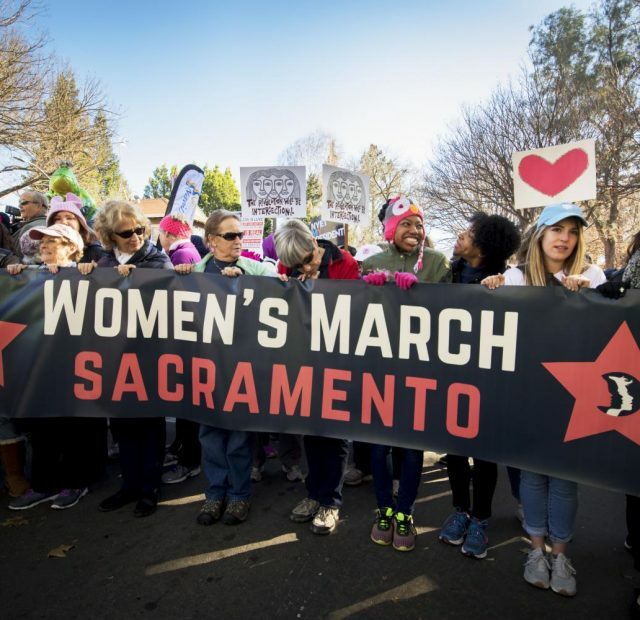 Young protesters wave their signs during the 2018 Women’s March at Southside park on Jan. 20 in Sacramento, California. 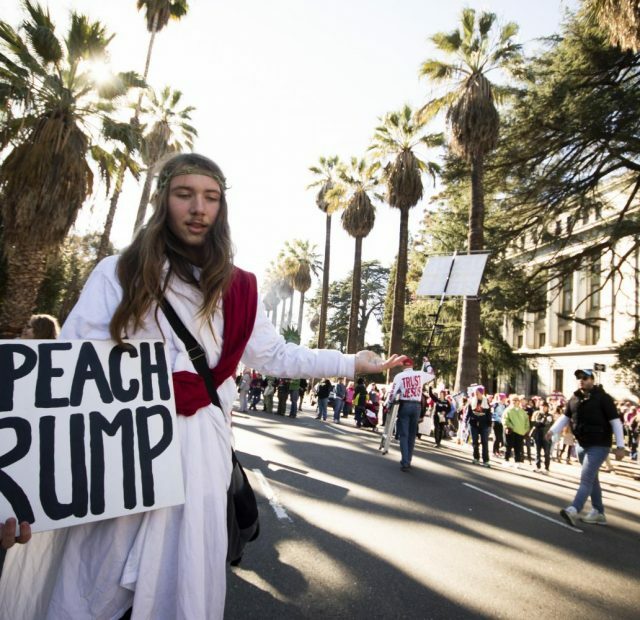 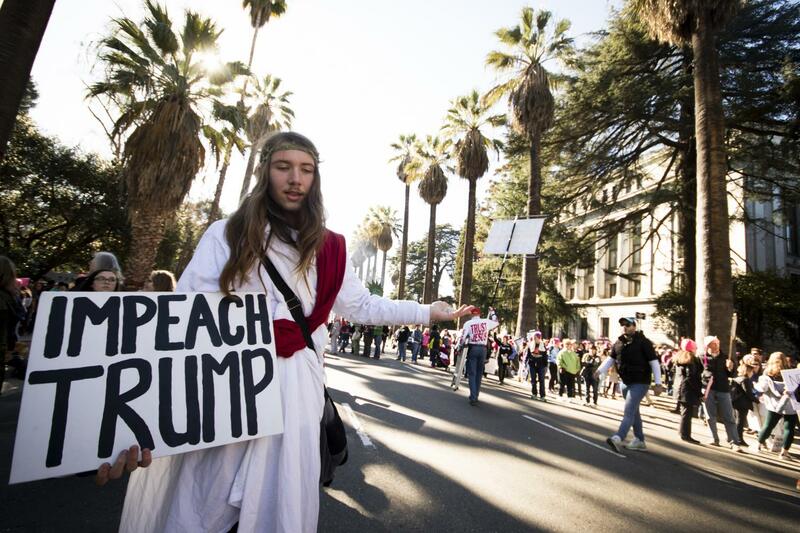 “Jesus Christ” poses with his protest sign in front of the California State Capitol during the 2018 Women’s March on Jan. 20, 2018. 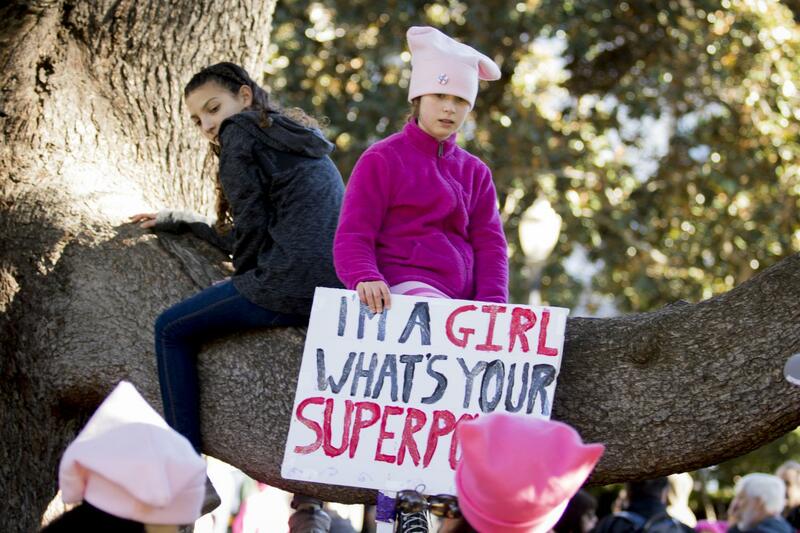 A child poses with her sign at the California State Capitol on Jan. 20, 2018 in Sacramento, California. 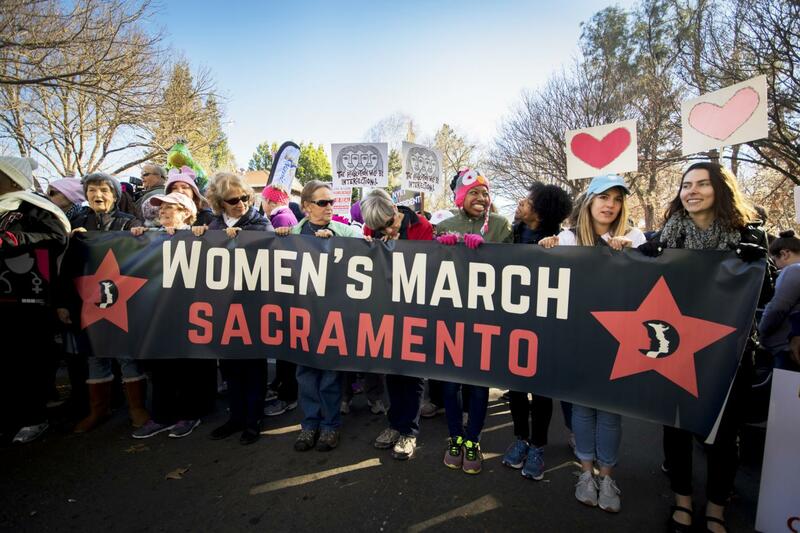 The Element Brass band plays at the California State Capitol during the 2018 Women’s March on Jan. 20, 2018 in Sacramento, California. 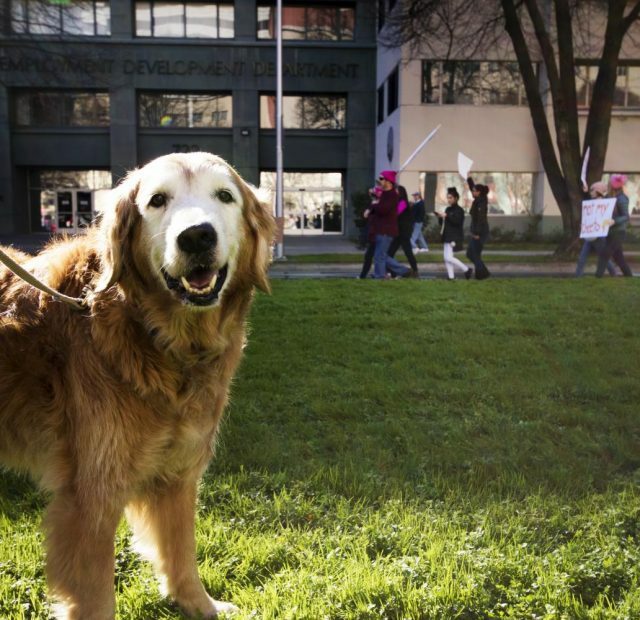 A dog poses while protesters of the Women’s March walk towards the California State Capitol on Jan. 20 in Sacramento, California. 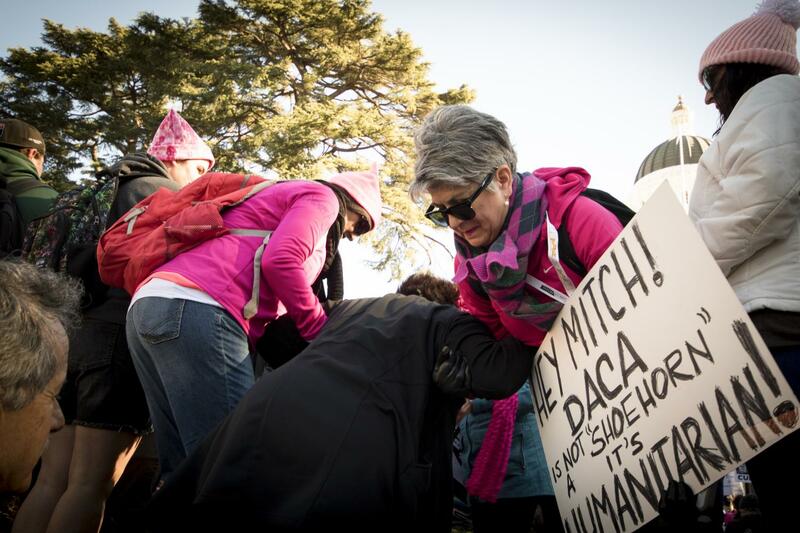 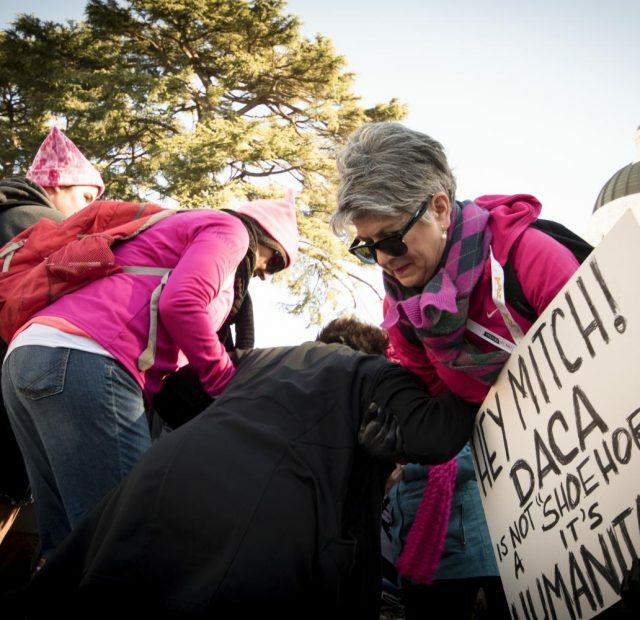 Angelica Orozco helps lift women over a cement barrier that leads to the Capitol where the annual Women’s March demostrations are taking place on Jan. 20, 2018 in Sacramento, California. 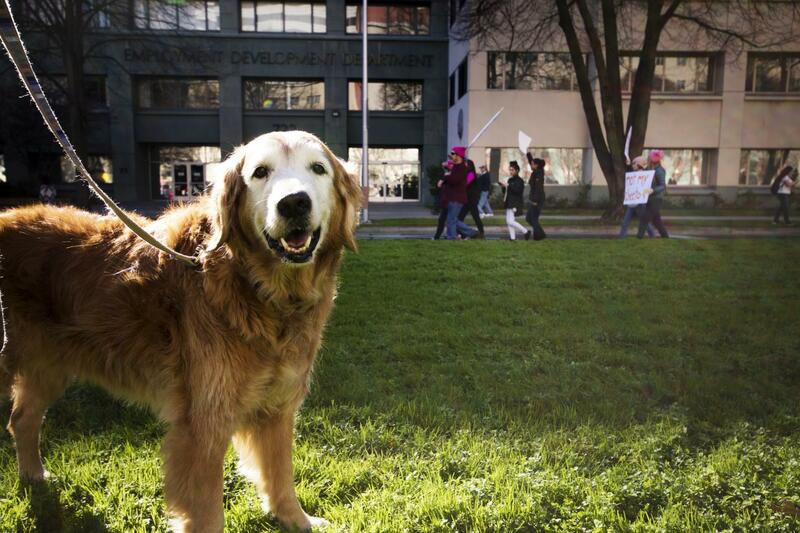 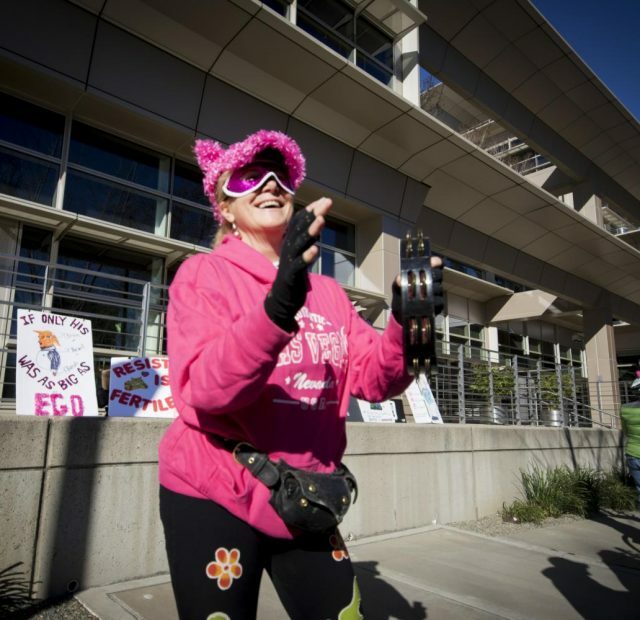 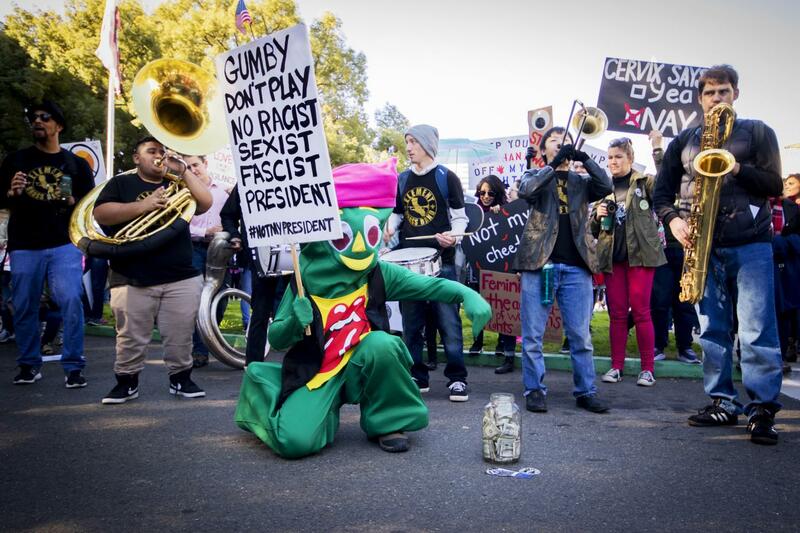 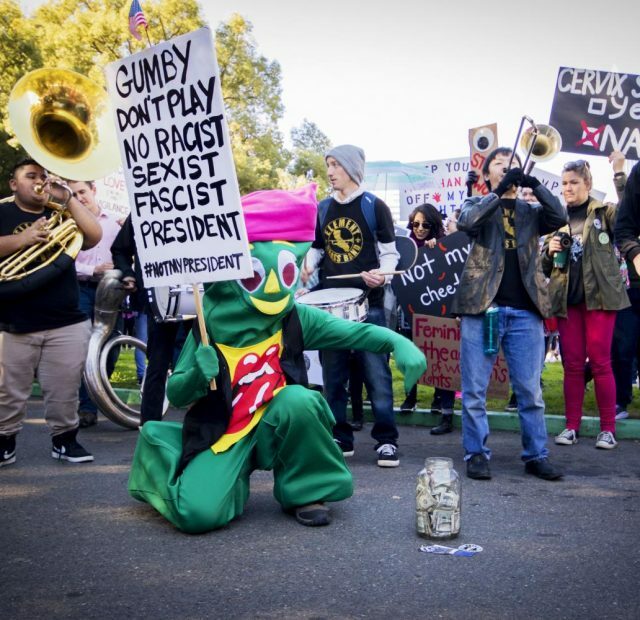 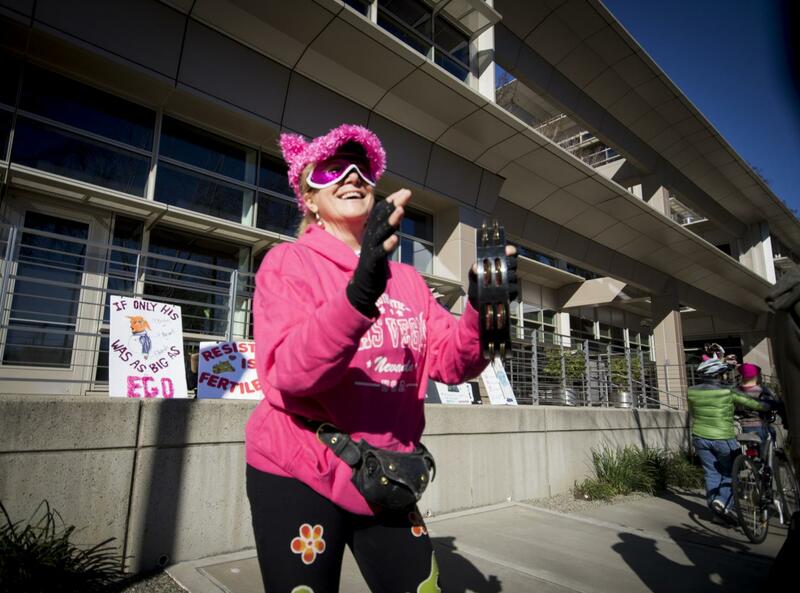 Bablou cheers on the protesters during their walk to the Capitol on Jan. 20, 2018 in Sacramento, California. 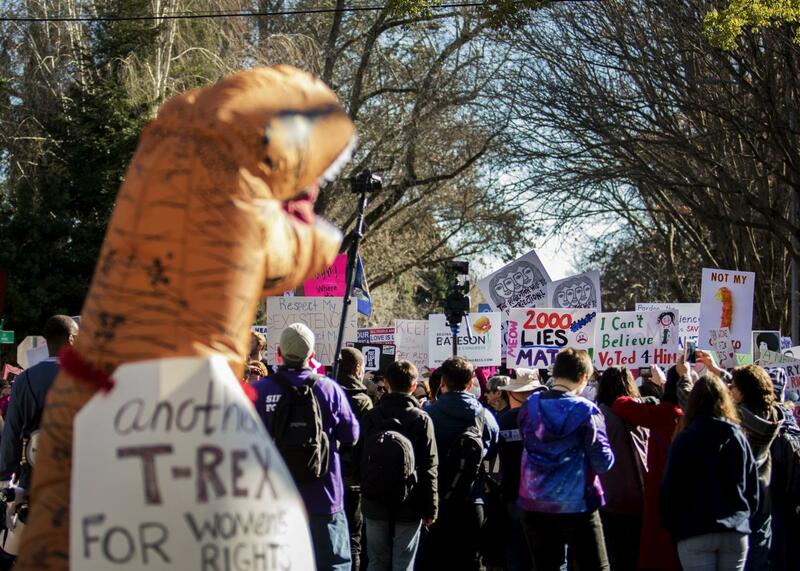 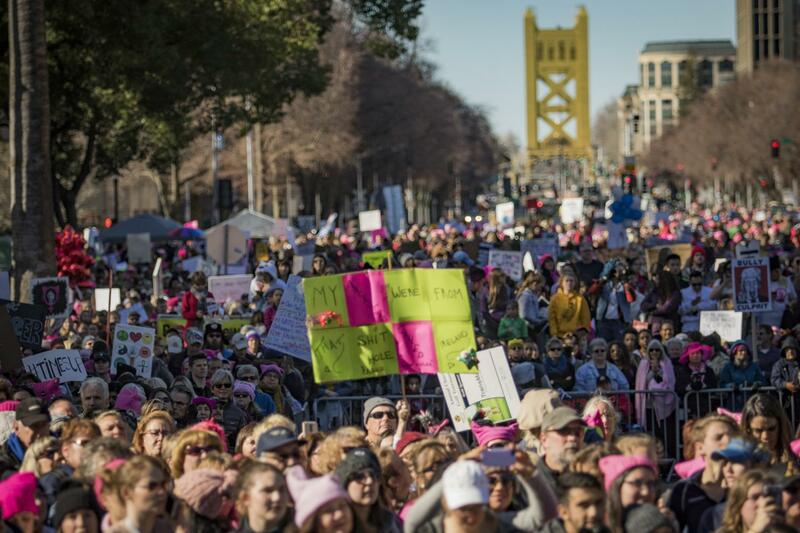 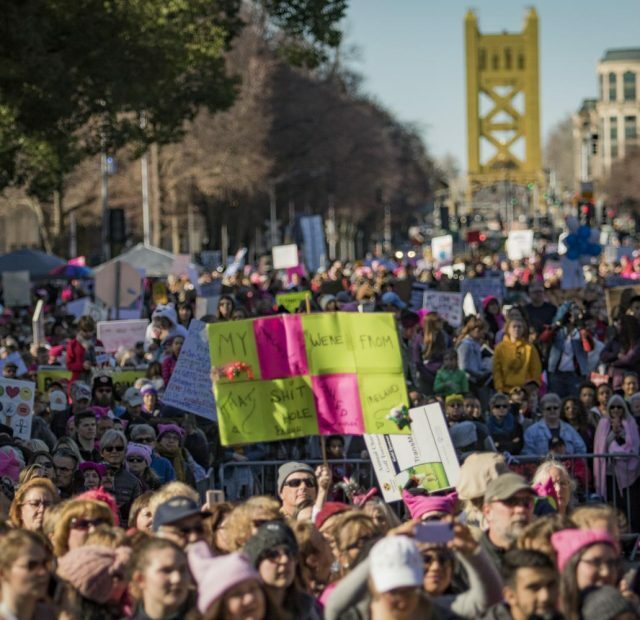 A crowd of more than 30,000 people gather in front of the Sacramento Capitol to advocate women’s right on Jan. 20, 2018 in Sacramento, California. 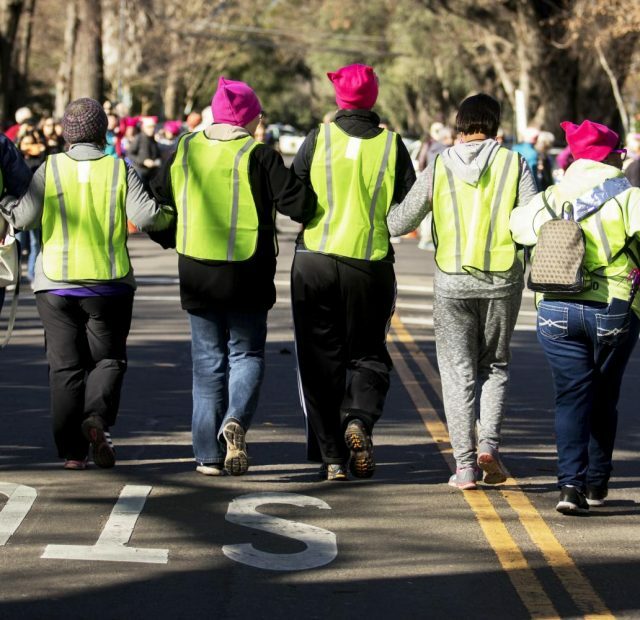 Be the first to comment on "Photo Gallery: 2018 Women’s March"